Beautiful Boy tells the true story of who, as a teenager, became addicted to crystal meth. Part of it is from his perspective, part of it is seen through the eyes of his father. David loves his son more than anything and will do whatever needs to be done to help Nic in his struggle. It is sad and emotional with very strong performances. Yet it somehow fails to completely connect. Though Director Felix van Groeningen and his co-screenwriter Luke Davies tried really hard to show the relationship between David and Nic using flashbacks, it was difficult for me to fully engage with them. This is a cautionary tale that feels too much like a lecture for its story to have the impact it should. David is a freelance writer who is divorced from Nic’s mom and remarried with two other kids. Though he loves his wife and all of his children, Nic is his life. They have always been close but, around the age of eighteen, Nic admits to his drug addiction. What follows is trips to rehab, attempts to go sober, relapses and overdoses. While it gets repetitive, well, that is what that process can be like. The problem is, as they come off in the movie, Nic is just an addict. David is just a suffering parent. Neither of them are ever more than that. It certainly gets across the pain of addiction and recovery, but there is not enough substance to successfully fill two hours. 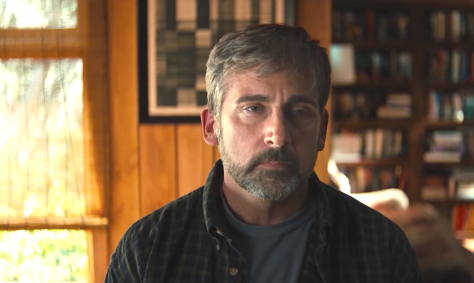 In recent years, Steve Carell has become a surprisingly reliable dramatic actor. He proved in last year’s Last Flag Flying that he is skilled at hinting at buried emotions and he showcases that here as well. Carell’s primary job as David Sheff is to fret about the well-being of his son. While I would have preferred if the screenplay (based on David Sheff’s 2008 memoir “Beautiful Boy: A Father’s Journey Through His Son’s Addiction” and Nic Sheff’s 2009 memoir “Tweak: Growing Up on Methamphetamines”) had dealt with its characters as people instead of symbols, he is able to believably convey anguish at being unable to do anything as someone he loves destroys himself. He has moments of great power as he tries to practically will Nic to overcome his addiction. Timothée Chalamet (Jewish on his mother’s side) is equally good as Nic. Chalamet was excellent last year in his Oscar nominated starring role in the brilliant Call Me by Your Name. This role lacks the subtlety or nuance of that one, but he does get to play a lot of emotions. He is happy, hopeful, sad, depressed or intensely angry, sometimes all in the same scene. That is not an easy thing to do. You can sense the smart, kind boy inside the needy, selfish addict. It is an impressive performance that deserved a more ambitious screenplay. It still could be enough to get him some nominations come awards season. Beautiful Boy is a harrowing story made into a movie with moving performances and some very powerful scenes. Unfortunately, that never builds into something greater than its individual moments. I do not expect this particular subject matter to be entertaining per se, but I do expect it to absorb me consistently on an emotional level. It has good intentions and definitely does not sugar-coat its drama. I just wish it had made the Sheff’s three-dimensional as opposed to devices used to further a message, as necessary as that message might be. Read Ben’s last movie review on Mid90s.